An artery is a blood vessel that carries blood that is high in oxygen and nutrients from the heart to nourish other parts of the body. The walls of an artery are very elastic as they are meant to withstand high pressure as blood is pumped out of the heart. The arteries gradually become smaller and smaller as they get out to the tissues until reaching the capillary bed, which consists of tiny, thin-walled vessels, where oxygen and nutrients exchange with carbon dioxide and waste products. The blood then continues into the veins, blood vessels that carry blood back to the heart. Normally, as the high-pressure arterial blood is pumped through a capillary bed there is a gradual decrease in blood pressure. The walls of veins are therefore not as elastic as arteries as they are not meant to carry blood under high pressure. In the brain, the veins drain blood into venous dural sinuses (not to be confused with the air-filled sinuses in the facial bones that are often associated with sinus infections, etc.). Venous dural sinuses are folds in the dura mater (lining of the brain) that collect blood and then drain into the internal jugular veins that bring blood back to the heart. Ultimately, the arterial blood rushes through the AVM, instead of working through available capillary beds, which feed the surrounding brain tissue, increasing blood flow through the nidus. This re-direction of the arterial blood away from the brain tissue and through the AVM is referred to as shunting. Over time, the high blood flow and shunting of high-pressure arterial blood through the AVM causes the feeder arteries and veins making up the AVM to dilate (or expand). This dilation weakens veins making them susceptible to hemorrhage; feeder arteries become susceptible to aneurysms, a weakened spot in the blood vessel wall that expands and can eventually hemorrhage. A hemorrhage in the brain is a type of stroke in which a blood vessel ruptures and bleeds into the surrounding brain. For more information on strokes, please visit the American Stroke Association at www.strokeassociation.org. There is a 10-15 percent risk of death, and a 20-30 percent chance of permanent brain damage, related to each bleed. Each time blood leaks into the brain, normal brain tissue is damaged. This results in loss of normal function, which may be temporary or permanent. Some possible symptoms include arm or leg weakness/paralysis, or difficulty with speech, vision, or memory. The amount of brain damage depends upon how much blood has leaked from the AVM (Higashida). Smaller AVMs present with hemorrhage more often than large ones. In addition, the size of the hematoma (a localized swelling filled with blood resulting from a break in a blood vessel) is larger from the small AVM, compared with the medium or large AVM. There appears to be no difference in the frequency of hemorrhage between large and medium AVMs. However, whether size of the AVM is a true risk factor is unclear. Treatment is primarily aimed at preventing new or future hemorrhage of the AVM. For more information on treatment, please visit the Treatment of AVMs section. The structure of the abnormal vessels varies between what is usually found in arteries and that of veins. The tissue in and around the abnormal vessels is usually a kind of scar or fibrotic tissue (gliotic), but sometimes brain tissue is also found in some regions of the AVM. AVMs may arise in the brain, spine, lungs, kidneys, and skin. Brain AVMs are the most common and can occur anywhere in the brain. When an AVM occurs in the dura mater of the brain (the outermost lining of the brain), this is called a dural arteriovenous fistula (DAVF). AVMs are thought to be congenital (that is, present at birth), arising from developmental derangements at the embryonic stage of vessel formation, at the fetal stage. However, this has never been clearly established and they may arise after birth. AVMs are usually single, except when associated with hereditary hemorrhagic telangiectasia (HHT). For more information on causes of AVMs, please visit the Causes of AVMs section. In about 50% of patients the presentation is a sudden hemorrhage, or bleeding into the brain, a form of stroke. Other potential complications include seizures, headaches, and stroke-like symptoms (difficulty with movement, speech, and vision). These complications may occur in conjunction with, or independently of, hemorrhage. The risk of hemorrhage is ~2-4% per year. There is a 10-15% risk of death related to each bleed and a 20-30% chance of permanent brain damage. The risk of bleeding is higher in the first years after the first bleed. After a first hemorrhage, if the AVM is not treated, the risk of another hemorrhage happening is about 3 times higher. However, for unknown reasons, this increased risk appears to decrease over time, so that eventually, the risk of a new bleed returns to the risk of rupture before the AVM presented. "Stroke-like" symptoms: problems speaking, numbness/tingling, muscle weakness, changes in vision. Generalized seizures, which involves the entire body and loss of consciousness. These types of seizures are more common in frontal AVMs. Focal seizures, "unusual feelings" or involuntary muscle movement, depending on the location of the AVM in the brain. People generally don't have a loss of consciousness. These types of seizures are more common with parietal AVMs. A seizure happens when a brief, strong surge of electrical activity affects part or all of the brain. It is thought that the scar tissue usually found in and around the abnormal vessels of an AVM disrupt the normal electrical activity of the brain causing seizures. For more information on seizures, please visit the Epilepsy Foundation at www.epilepsyfoundation.org . Headache is the symptom that leads to diagnosis in 7-48% of patients. These headaches usually do not have any distinctive features, such as frequency, duration, or severity. Whether AVMs cause headaches is not clear. Focal neurological deficits without signs of underlying hemorrhage have been reported in 1 to 40% of patients. 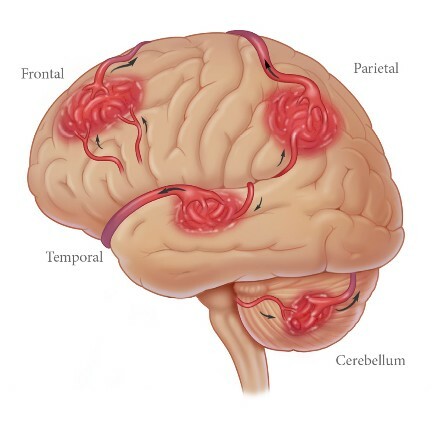 Traditionally, these symptoms were ascribed to a problem called "cerebral steal" - redirection of the blood flow from surrounding brain tissue through the AVM disrupting the normal functioning of the surrounding brain tissue. (Taylor et al) But there is very little evidence that "cerebral steal" is a clinically important mechanism. Because AVMs are most likely congenital lesions; they can be discovered in children. Although most childhood AVMs are detected in school-aged children, they can also become symptomatic in the first few days of life. As in adults, AVMs in children can present with a brain hemorrhage, seizures, headache, focal neurological deficits, or incidentally. In addition, large AVMs in newborns can cause congestive heart failure. These babies will present with respiratory distress (rapid, distressed breathing). This is particularly true of babies with a specific type of AVM called a Vein of Galen Malformation (VOGM). Compared to those in adults, AVMs in children are more likely to present with bleeding. The reason for this is not known. It could represent a biological difference between the AVMs in children versus adults. On the other hand, it could simply be due to children being less likely to get imaging studies that might detect an AVM unless they present with very severe symptoms, such as symptoms of a hemorrhage. Children appear to have a similar annual (yearly) risk for spontaneous bleeding compared to adults. If you correct for the fact that AVMs in children are more likely to present with hemorrhage than those in adults, childhood AVMs might actually be at lower risk for spontaneous bleeding. However, this has to be balanced with the longer expected life-span of a child compared to an adult. All other things being equal, a child will have a higher risk of bleeding from an AVM simply because he or she will be living with that AVM for longer. Intracerebral hemorrhage (ICH) and subarachnoid hemorrhage (SAH) of an AVM are uncommon complications of pregnancy. The occurrence of SAH during pregnancy is ~1:1,000 pregnancies, a rate that is five times higher then in non-pregnant women. 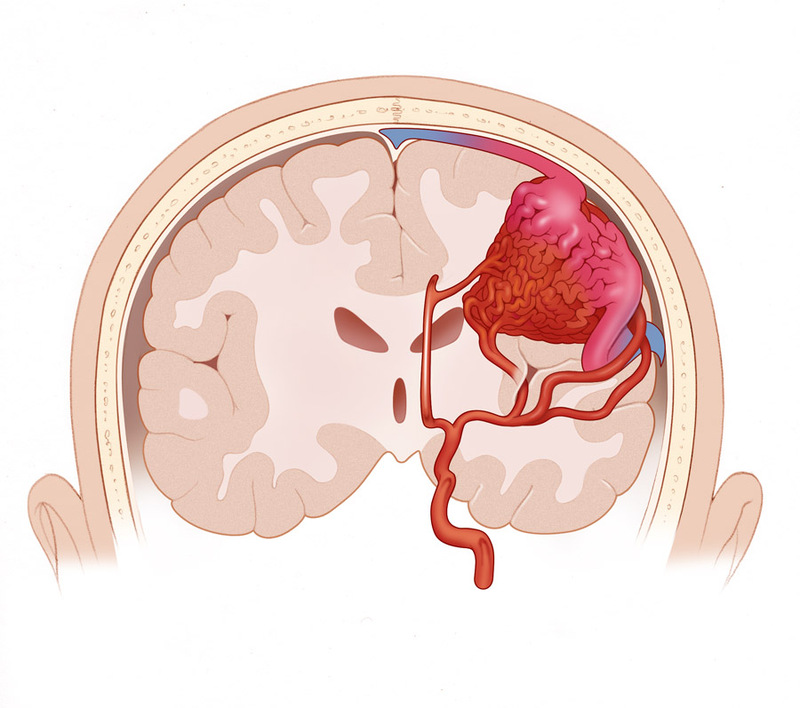 In a review of all ICH complicating pregnancy, 77% were caused by aneurysms, and 23% by AVM. In compiling all of the data, it is noted that the AVM hemorrhages were in younger women, but there was no relation between hemorrhage and parity or gestational age. It is recommended that women with AVMs considering pregnancy consult with their physician. Many women go on to have normal pregnancies and deliveries. AVMs arise in the brain, spine, lungs, kidneys and skin. Brain AVMs are the most common. The overall ratio of AVMs to aneurysms is probably in the range of 1:10. Most patients present between the ages of 20 and 60 years of age. The mean age is about 35-40. AVMs are equally distributed between male/female. Patients with AVMs may have additional vascular anomalies that increase the complexity of treatment. Approximately 10-58% of patients have various kinds of aneurysms. It is estimated that in the United States 18 in 100,000 have an AVM in the brain. When an AVM bleeds, there is a 10-15% risk of death related to each bleed and a 20-30% chance of permanent brain damage. The risk of bleeding is higher in the first years after the first bleed. 1. 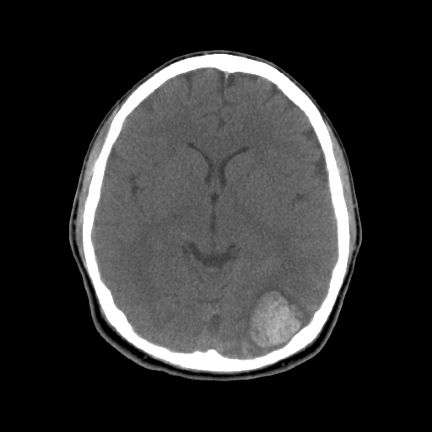 Halim AX, Johnston SC, Singh V, McCulloch CE, Bennett JP, Achrol AS, Sidney S, Young WL: Longitudinal risk of intracranial hemorrhage in patients with arteriovenous malformation of the brain within a defined population. Stroke 35:1697-1702, 2004. 2. Choi JH, Mast H, Sciacca RR, Hartmann A, Khaw AV, Mohr JP, Sacco RL, Stapf C, Clinical outcome after first and recurrent hemorrhage in patients with untreated brain arteriovenous malformation. Stroke 37:1243-7, 2006. 4. Mast H, Mohr JP, Osipov A, Pile-Spellman J, Marshall RS, Lazar RM, Stein BM, Young WL: "Steal" is an unestablished mechanism for the clinical presentation of cerebral arteriovenous malformations. Stroke 26:1215-1220, 1995. 5. Taylor CL, Selman WR, Ratcheson RA: Steal affecting the central nervous system. Neurosurgery 50:679-88; discussion 688-9, 2002. 7. Lawton, Michael T, and Robert F Spetzler. 1997. Surgical Management of Acutely Ruptured Arteriovenous Malformations. In Primer on Cerebrovascular Diseases, ed. Louis R. Caplan, Donald J. Reis, Bo K. Siesjo, Bruce Weir, and K. Michael Welch, 511 - 519. San Diego: Academic Press. 8. David, Carlos A, and Roberto C. Heros. 1997. Surgical Management of Unruptured Arteriovenous Malformations. In Primer on Cerebrovascular Diseases, ed. Louis R. Caplan, Donald J. Reis, Bo K. Siesjo, Bruce Weir, and K. Michael Welch, 520 - 525. San Deigo: Academic Press. 9. Malik, Ghaus. 1997. Special Considerations in Treating Arteriovenous Malformations. In Primer on Cerebrovascular Diseases, ed. Louis R. Caplan, Donald J. Reis, Bo K. Siesjo, Bruce Weir, and K. Michael Welch, 525 - 528. San Diego, Academic Press.